How many of you already looking forward to cold temperatures? While some of my family loves summer, my husband and I thrive once the temperature gets below 60 degrees. Nothing is better than hiking in the woods or the local arboretum on a cool day, especially with two excited-to-explore dogs in front of you. The only thing I don’t look forward to is the humidity in our house. I was always envious of the people who have to add humidity during the winter, but we are constantly having a dehumidifier going to keep our house from feeling like a muggy summer day. With our current one unable to keep up with the size of our house, we knew it was time to add another dehumidifier before winter hit. 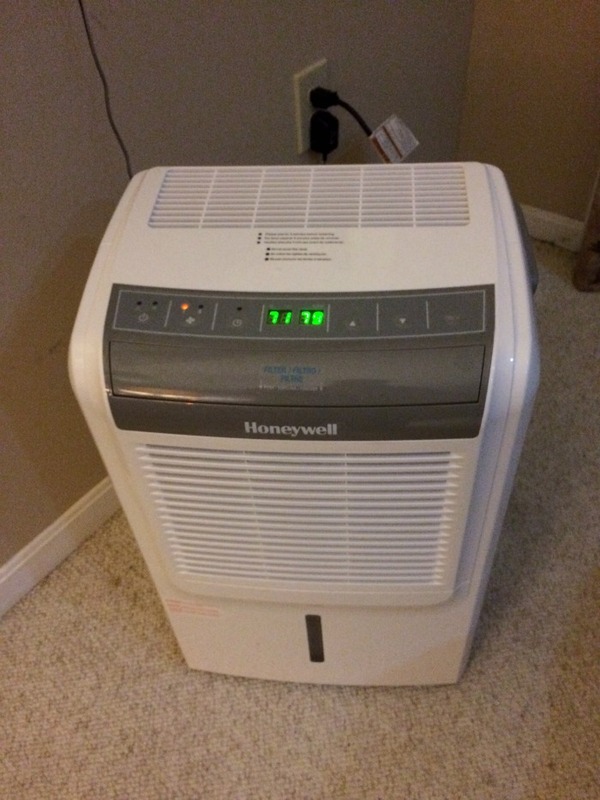 Luckily, we recently found the perfect addition to our home – the Honeywell DH50W Dehumidifier! Honeywell DH50W Dehumidifier: What is It? Looking for an awesome, easy to use dehumidifier for your home? 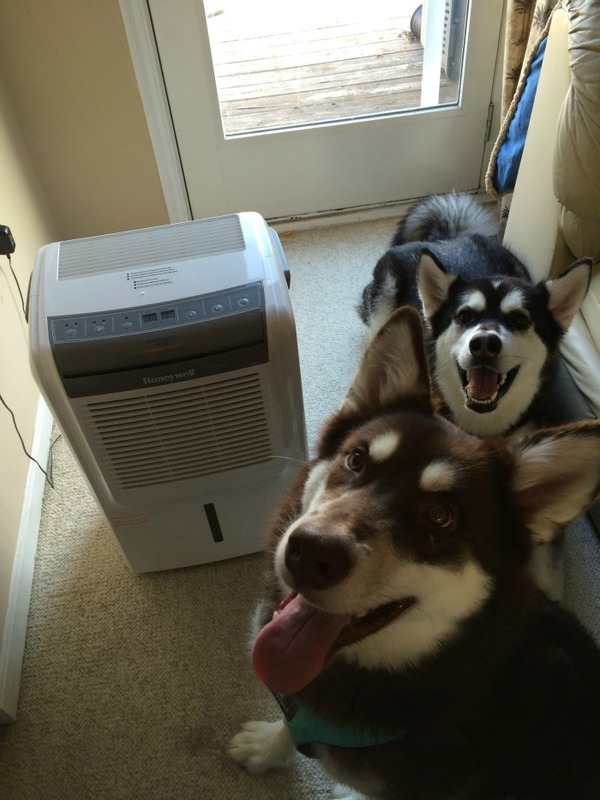 If so, we think you will love the Honeywell DH50W Dehumidifier. This innovative, portable dehumidifier controls humidity to prevent mold and mildew, while also making your home more comfortable. As well, this energy star certified humidifier can remove up to 50 pints of humidity in the air, making it the perfect size for large to medium rooms in your home, including basements, dens, living rooms, kitchens, bedrooms, and even bathrooms! Once the tank is full, the unit will also alert you and automatically shut off to make sure it doesn’t overflow. With the system’s ergonomical water tank handle, emptying it also very easy, allowing anyone in your home to empty out the dehumidifier. As well, the unit features a digital control with electronic display, showing you the room temperature and humidity level, allowing you to determine how much you want to dehumidify the air (it can even dehumidify chilly rooms down to 41 degrees F). With an easy access washable filter and smooth gliding casters for moving the unit, the Honeywell DH50W Dehumidifier is perfect for just about any household! So far, I have to say we are very impressed with the Honeywell DH50W Dehumidifier. Not only is it much quieter than our current dehumidifier, but gives you quite a bit of information as well. Our old model was pretty much plug in and go, but was extremely noisy and the dogs HATED it. The Honeywell is so quiet the dogs don’t mind hanging out near it and mostly ignore the dehumidifier, which I think is pretty awesome! 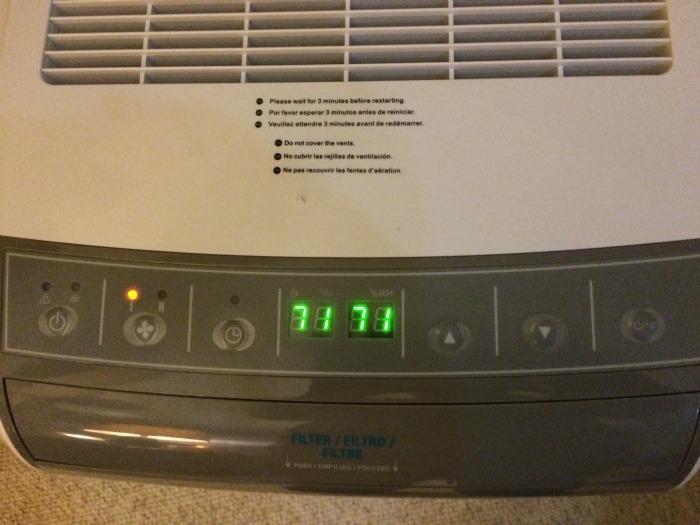 As well, it gives us quite a few useful readings and options, allowing us to customize the dehumidifier to our living room. As well, cleaning the filter and dumping the water is very easy. The unit even has a continuous drain feature, which is pretty spiffy if you have a drain area in your basement (like us). Honestly, if you want to remove humidity from your home without having any noisy distractions or a machine that takes a great deal of upkeep, the Honeywell DH50W Dehumidifier is perfect for you. Based on our own experience, we are delighted to give the Honeywell DH50W Dehumidifier an A+ rating. Want to purchase this awesome dehumidifier for your own family? You can buy the Honeywell DH50W Dehumidifier on the Honeywell store for only $279.95. Currently, however, this dehumidifier is on sale for only $248.95 with free shipping, allowing you to buy this awesome dehumidifier at an amazing price before winter hits! Want to learn more? Check out JMATEK on Social Media! Omgosh yes!! Our house is so awful with humidity!! Its making me absolutely crazy! We run the air conditioner all the time just to try to get the humidity out of the house and I swear it doesn’t work and is just costing us way more money!! I love that this is so quiet it doesn’t bother your dogs. 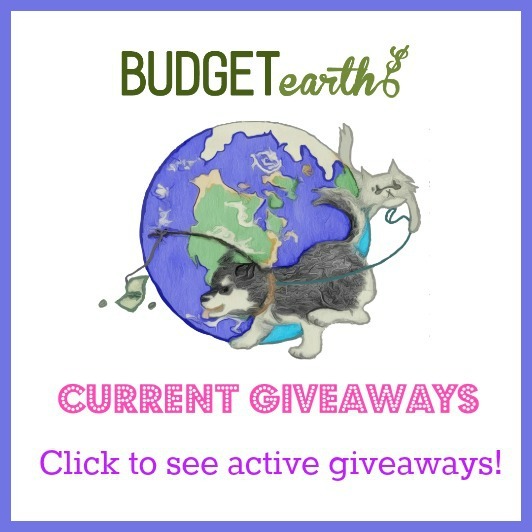 My chihuahua attacks the vacuum due to the noise so anything in my house that creates extra noise just freaks him out….this sounds like it would be a great fit for our home. This seems like a good dehumidifier. My dad & mom can use a new one. Since we bought our house in 2008 we’ve gone through 2 dehumidifiers. Our poor basement needs to have one running almost 24/7. Our current one I’m not so pleased with as it likes to not auto shut off when full grrr….This one is bigger than our current one and looks like it would work really well for us. Thank you for sharing your great review. I have been thinking about getting a dehumidifier. Here in Colorado we need a humidifier not a dehumidifier. I can tell your puppies like cold weather. Your babies look so happy. Thanks for the review– I wish we had one of these– We got a honeywell a few years back, and it works pretty well– this is so much nicer and does a little more. I always used a Dehumidifier in the summer muggy months and a Humidifier in the dry winter months.. But I have moved into a new home and would consider one for summer. Is there a price on this one? Maybe a discount? I so need one of these. This old house smells musty all the time no matter what I do. I’ve spent so much money in room deodorizers that I could have bought one of these by now. Would help a great deal to have this in the basement here! We could really use one of these. People don’t think of SoCal as humid, but it is. PS: I love your dogs! I definitely need a unit like this! My apartment is heated by electric heaters, and the winters get extremely dry. So, this machine would help me stop the winter nose bleeds and skin cracking! I love honeywell, I have a smaller version of that one your showing for my small office and it works wonderful,,Also love your pictures of your beautiful dogs..
I’M IN NEED OF A HUMIDIFIER. WE ARE ALL ASTHMATICS. I HAD ONE BUT IT BROKE. IT HELPED ME SO MUCH WITH MY BREATHING. I HAVE BEEN TRYING TO FOUND THE SAME ONE. BUT IT WAS SO OLD THEY DONT MAKE THAT TYPE NO MORE. I know Honeywell makes great products; I know someone who has a Honeywell home alarm system and is very happy with it. It can get humid even where I live in San Diego, so this would be nice to have! Man I wish I had your problem. Our house is SO SO dry in the winter that it is just awful. We wake up with dry eyes and my hands get dried out something terrible. Our house get very dry in the winter so we run humidifiers on every level. I also keep vaporizers near the beds to keep everyone healthy and sleeping better. 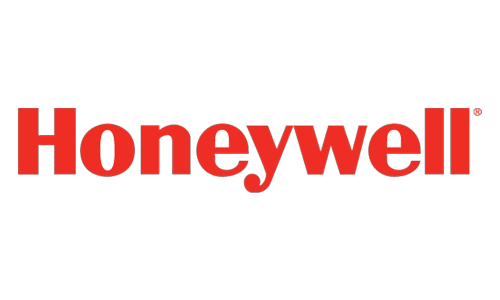 Honeywell is such a great brand! I have one of their dehimdifiers from years ago and it runs like a chanp. This is another nice product. This drives me insane too! My bathroom is the worst! I have one but not the exact model. Very handy to have. Very nice upgrade from dehumidifiers I have had in the past. I like that this one has a sensor & also automatic shut off. Your doggies are so cute! 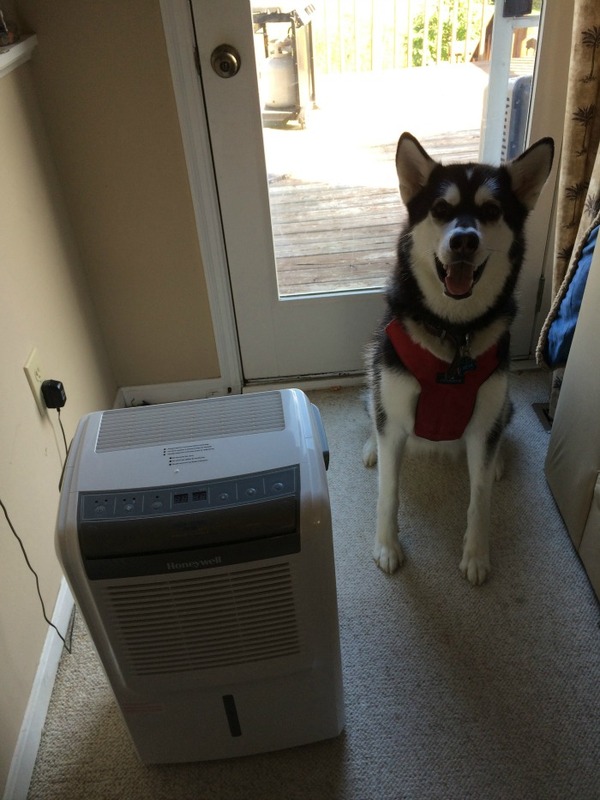 I never really thought of Dehumidifier for our home since we don’t have a basement anymore, but now that I read your review, it does make sense! Here in IL, it gets really humid! Thanks for the info! I really like this! I think this would work great for our home. Good review! Thanks!